(Nanowerk News) A group of Marshall University researchers and their colleagues in Japan are conducting research that may lead to new ways to move or position single molecules—a necessary step if man someday hopes to build molecular machines or other devices capable of working at very small scales. Dr. Eric Blough, a member of the research team and an associate professor in Marshall University's Department of Biological Sciences, said his group has shown how bionanomotors can be used some day to move and manipulate molecules at the nanoscale. 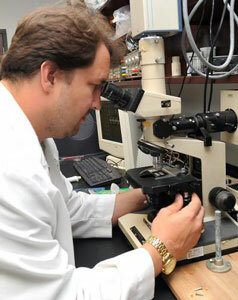 Their research will be published in the Feb. 5 issue of the research journal Small. "Being able to manipulate a single molecule under controlled conditions is actually a pretty big challenge," said Blough. "It's not quite the same, but imagine trying to pick up a single sewing needle off the ground with a huge steam shovel, and doing it so that you pick up the needle and nothing else. Or, to put it another way—how do you manipulate something that is very tiny with something that is very big? We decided to try and get around this problem by seeing if it was possible to use single molecules to move other single molecules." "What we are trying to replicate in the lab is something that nature has been doing for millions of years—cells use bionanomotors all the time to move things around," he said. Blough describes bionanomotors as naturally occurring tiny "machines" that convert chemical energy directly into mechanical work. A nanometer is about 1/100,000 the width of a human hair. A nanomotor is similarly sized and operates at the smallest of small scales. "Our muscles are living proof of how bionanomotors can be harnessed to do useful work," he added. In the lab, Blough and his colleagues used myosin—a protein found in muscle that is responsible for generating the force of muscle contraction—as the motor, and actin—another protein isolated from muscle—as the carrier. Using a technique to make a pattern of active myosin molecules on a surface, they showed how cargo—they used small beads—could be attached to actin filaments and moved from one part of the surface to another. To improve the system, they also used actin filaments they had bundled together. "When we first started our work, we noticed that single actin filaments moved randomly," said Dr. Hideyo Takatsuki, lead author of the journal article and a postdoctoral fellow in Blough's laboratory. "To be able to transport something from point A to point B effectively you need to be able to have some control over the movement. The actin filaments are so flexible that it is difficult to control their motion but we found that if we bundled a bunch of them together, the movement of the filaments was almost straight." In addition, the team also showed they could use light to control the movement of the filaments. "For a transport system to work efficiently, you really need to have the ability to stop the carrier to pick up cargo, as well as the means to stop transport when you arrive at your destination," added Takatsuki. To control the movement, they chose to exploit the chemical properties of another molecule called blebbistatin. "Blebbistatin is an inhibitor of myosin and can be switched on and off by light," Blough said. "We found that we could stop and start movement by changing how the system was illuminated." According to Blough, the long-range goal of the team's work is to develop a platform for the development of a wide range of nanoscale transport and sensing applications in the biomedical field. "The promise of nanotechnology is immense," he said. "Someday it might be possible to perform diagnostic tests using incredibly small amounts of sample that can be run in a very short period of time and with a high degree of accuracy. The implications for improving human health are incredible." Blough added that although their recent work is a step forward, there is still a long way to go. "A number of further advancements are necessary before bionanomotors can be used for 'lab-on-a-chip' applications," he said. "It's a challenging problem, but that is one of the great things about science—every day is new and interesting."